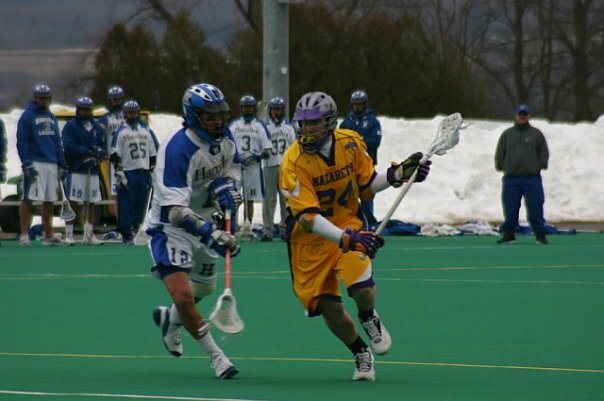 On this day 8 years ago, Conor O’Keefe ’03 scored 4 goals to lead Nazareth College to a 14-8 win over Connecticut College. The Camels opened the scoring just 2:06 into the first quarter, but O’Keefe began a 7-0 scoring run for the Golden Flyers with an unassisted goal. He scored twice more during that stretch which gave Nazareth a 7-1 lead less than ten minutes later. With the win Nazareth improved to 4-0 en route to a 13-2 regular season record and an Empire 8 Tournament Championship.